Do you remember floppy disks? From 8 inch to 5 ¼ and then 3 ½ inches? My brother Tom and I needed 6 floppies to load The Adventures of Willy Beamish, and losing them to magnets or water sucked. Something is happening to change that (again). I also had no idea what a Kilobyte or Megabyte meant at the time. I didn’t really care, to be honest. Half of the fun was just getting the game to work. I was also happy that I didn’t need this 5MB IBM Hard Drive from 1956 to load my games. Yes, that’s what 5MB looked like. Technology moves fast. Like, Moore’s Law-hasn’t-been-broken-yet fast. It’s hard to even understand how I experienced technology when I was younger. Pretty soon, my kids will know what the Petabyte, Exabyte, and Yottabyte are. They’ll never have to experience the joy of loading 8 floppy disks for half an hour to play Leisure Suit Larry. What’s alien to many people, will be native to our children. I feel the same way about Blockchain. No matter how I explain what Blockchain is or what the potential impact will be, I still get blank stares. It’s like everyone is walking in the air, and I’m walking on the street, trying to explain what gravity is. The same goes for Bitcoin. Wouldn’t you want to spend things as easily as you could, anywhere in the world for the same amount of universal currency? That’s what Bitcoin is, a decentralized currency running on a blockchain. 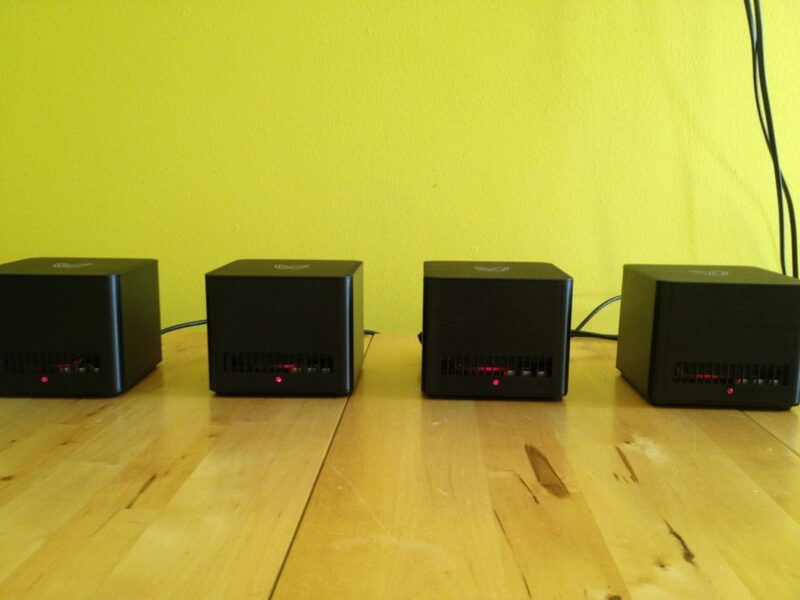 I bought my first “Bitcoin mining rig” in 2012, and it heated our tiny kitchen, fans whirring day and night. It took me 5 days to mine a single coin. I learned a lot… about Satoshi’s vision, and mining pools, Merkel trees, and the insane culture of “HODL”… and the arguments of who was a scammer and who wasn’t. It’s a culture obsessed with achieving the future. They mistrust anything that’ll slow it down. But it’s not about the money, just like the internet’s not about a single website or game. It’s about the tech powering it all, this underlying force that both stores and manages transactions. One of my favorite “wow” moments is from the TODAY Show in 1994 with Katie Couric and Bryant Gumbel. They have no clue what the internet is and struggle with the lingo of an “@” symbol. They crack me up… but then I realize I’m them. I try to explain a Merkle tree, and it feels… so out of reach. How can I explain a technology that has *potential* to make an impact, but you can’t show evidence of the impact? I struggle with that question every day. To me, the impacts of the blockchain and cryptocurrency is clear. To everyone else, they’re going to “believe it when they see it.” I don’t blame them either. The Chicago Cubs didn’t win the world series until they actually won the world series. I didn’t believe it until I saw it. I didn’t care that a few years prior they brought in a new management team and brought in new talent with high expectations. I’ve heard that story before. I only believed it when I was involved and saw them win on live TV. I truly believe that technology can help us create our Utopian world. I also believe that for us to create a Utopian world, we have to understand and embrace new groundbreaking technologies like blockchain as soon as possible. THE POSITIVE IMPACT OF BITCOIN IS REAL FOR THE UNBANKED. As I said before, I think technology can make the world better for all of us around the globe, not just the lucky, or privileged few. The strongest use case for bitcoin, in my opinion, is for the unbanked citizens in third world countries. Right now the unbanked use services like Western Union to transfer money internationally to their family. The biggest problem is that WU takes a sizable portion of that money to process the transaction. Not because they’re an evil corp, but they have to deal with regulations and paperwork in each country to make the transaction legit. Completely fair. There’s a lot of bureaucracy in play, and everyone wants their cut. With bitcoin and blockchain, that week wait goes down to seconds with zero taxes and minimal fees. Wow. Also, if you’re in a country where you’re worried about the value of the currency when your country isn’t doing too well economically, you can rest assured that since bitcoin isn’t tied to your government. The value will not be affected. It happened in Iran and South America. It’ll happen again. Of course, this doesn’t mean that bitcoin itself won’t fluctuate, but that’s a different story. Again, it’s not about the money. It’s about the data. The internet connected us through applications like AOL, Facebook, and the iPhone. But our data is siloed: on phones, or central data stores by private corporations like Google, or Chase. With the Blockchain, our data will be public, distributed, and real. We take for granted what corporations tell us: the number of viewers, how many monthly active users, or if who we’re talking to is real or not. The integrity of any system is backed only by the integrity of the corporation holding that data. With the blockchain, all our data becomes as connected as we are. When a corporation becomes big, but still wants to grow, it starts to expose its data so you can leverage them by extending applications… with tech like an API. Ideally, this is symbiotic: you build applications on that data-set, they get more use from their data, becoming more valuable. I’ve been in many hackathons (from Uber to Hearst, to Houghton Mifflin Harcourt) and they’re all leveraging data they privately store and expose. What are the implications of a world where there’s open data that anyone can see and use? It sounds weird, like gravity. We are in the early stages of something that will have a tremendous, global, positive impact. When it finally all comes together, it will all make sense. The internet connects people. Soon, the Blockchain will connect data. It’s the internet-of-data. BLOCKCHAIN WON’T HAVE A “GRADUAL” IMPACT. IT WILL COME LIKE A TSUNAMI. Does the blockchain or decentralized applications (“dapps”) like Bitcoin directly impact you at this moment? Did the internet have a significant impact on you when it was created? It’s because the blockchain is in the same stage as the internet was. Blockchain is a foundational technology: It has the potential to create new foundations for our economic and social systems. But while the impact will be enormous, it will take decades for blockchain to seep into our economic and social infrastructure. The process of adoption will be gradual and steady, not sudden, as waves of technological and institutional change gain momentum. I respect the HBR, but they’re wrong. It’s going to come like a tsunami: first, very slowly. Then, all at once. Right now, people are building great practical applications on the blockchain. Blockchain is going to break and remold the “you-name-it” industry. Can you imagine any industry not broken (and then saved) by the internet? Our utopia has the internet. And it definitely has the Blockchain. Enter your Name & Email below to get the latest Dom & Tom posts in one convenient newsletter!